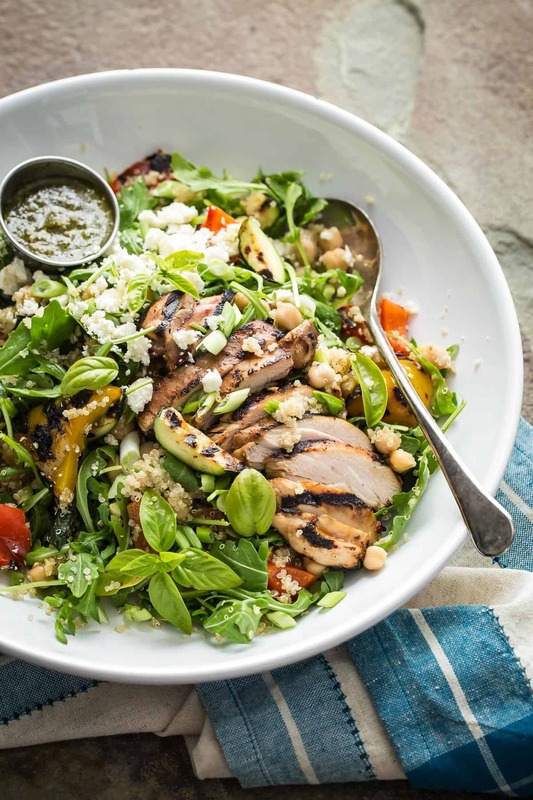 A super healthy Quinoa Vegetable Salad loaded with grilled chicken, arugula, grilled veggies, garbanzo beans and feta cheese. This should be on your New Year’s resolutions menu! I can’t do it anymore friends. These past few months have been filled with so many good things to eat but I’m spent. First it was Thanksgiving, then a cruise and to finish up, we had a mountain of Chinese food for Christmas. I just need a nice fresh green leafy salad or some kind of tasty bowl like this Shrimp and Roasted Cauliflower. 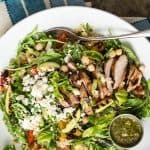 I’m in love with salads that aren’t only packed with leaves, throw in some grains and a protein and it becomes a full-on meal. You could use any grain you feel like adding for this Quinoa Vegetable Salad. I decided on quinoa because it’s so darn easy to cook in the first place and always turns out perfect, unlike rice which can be hit or miss for me to get it light an fluffy. 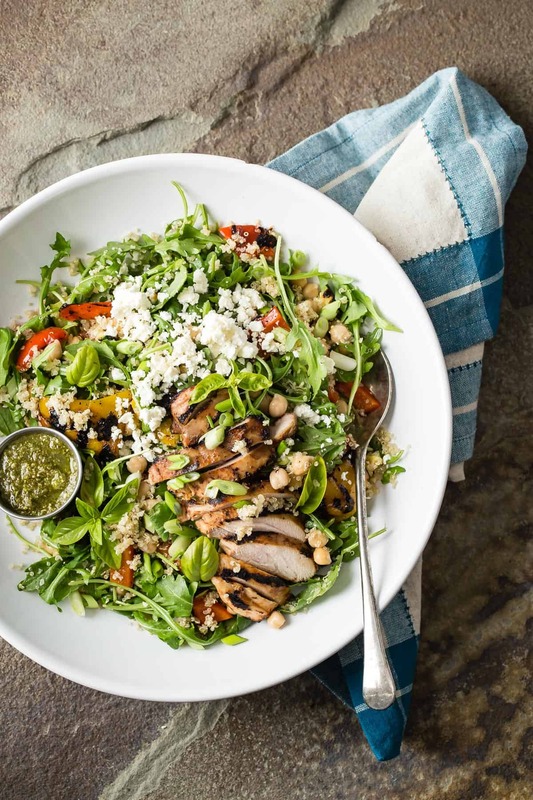 And by adding a good few handfuls of arugula to the quinoa, you just made this recipe stretch out even further. This is such a cheap dinner! This whole thing started out as a bit of a fridge clean up to be honest with you. Both the veggies and the chicken were grilled for quickness and max flavor, I found a can of garbanzo beans in the cupboard and I pulled the basil from the garden. I skipped making a fancy dressing for this and used pesto instead. This is such an awesome hearty salad to begin with that probably any salad dressing you have would work on it. I went with pesto because my kids would bathe in it of they could, just a few dollops of it and a quick toss is all you need to do. It felt so good to eat this after the holidays. Let me know in the comments if you have a favorite grain bowl or healthy salad you love to munch on! 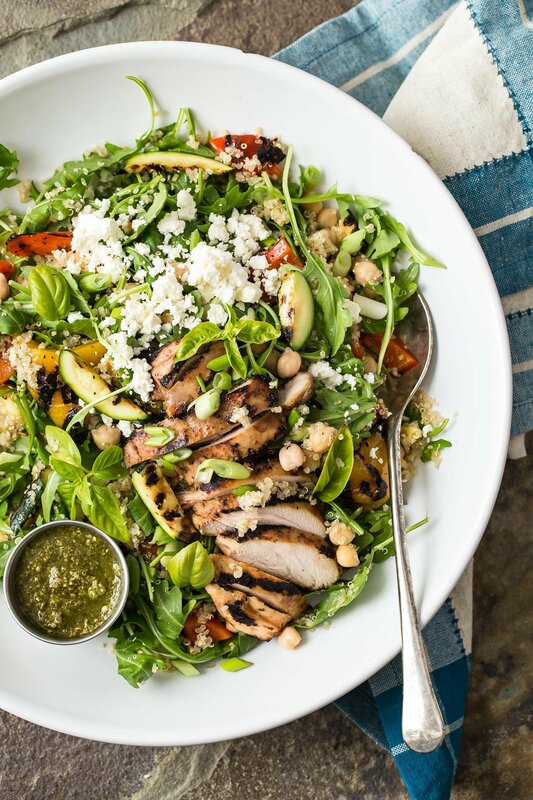 A super healthy Quinoa Vegetable Salad loaded with grilled chicken, arugula, grilled veggies, garbanzo beans and feta cheese. This should be on your New Year's resolutions menu! Season the chicken with your choice of favorite rub. Preheat the grill to high. Slice the zucchini into 4 even strips and place on a tray or baking dish. Slice off the tops of the peppers and take out the center seed part. Slice the peppers into flat pieces easy for grilling and place in the same dish as the zucchini. Pour the olive oil over the vegetables and season with salt and black pepper. Grill the vegetables for 3-4 minutes each side and set aside. Grill the chicken for about 5-6 minutes each side and no longer pink in the middle and let rest on a separate plate. 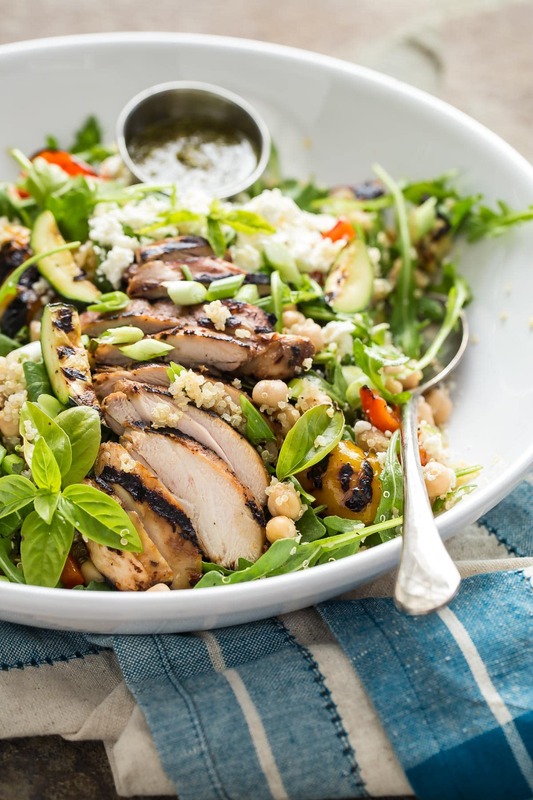 In a large platter or salad bowl add the cooked quinoa, garlic, green onion, garbanzo beans and arugula. Roughly chop the grilled vegetables into large pieces and add to the bowl. Toss the ingredients in the bowl and lay the sliced chicken on top. Garnish with the feta cheese and fresh basil. Serve with some of the pesto sauce on the side. Gerry- This is the kind of salad that I like. Quinoa and Bulgur are my favorite grains to mix with greens. The pesto is a nice touch that I didn’t think about it. My resolution to eat a healthier lunch just got a lot easier with this fab salad!